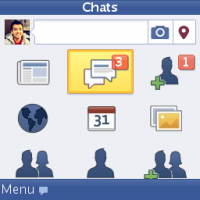 Stay connected using the latest Facebook app with real-time chat features! Instant chat messages, get push notifications (select devices), send group messages and photos, and use emoticons. Plus, share status updates, comment and like, check your news feed, plan events, review and post photos, check-in and much more! Join the Facebook community of over 1 billion+ people!